In certain hair salons lies a relatively unknown risk to your health and potentially even your life! This danger was brought to light by a young woman, Elizabeth Smith, whose trip to the Blowbunny Salon in San Francisco, ended with her being rushed to the emergency room. Upon arrival she was evaluated with a CT scan which showed that an artery in her neck had been damaged. The doctors explained to her that this had caused her to have a stroke! How in the world could this have happened from simply getting her hair washed at the salon sink?! 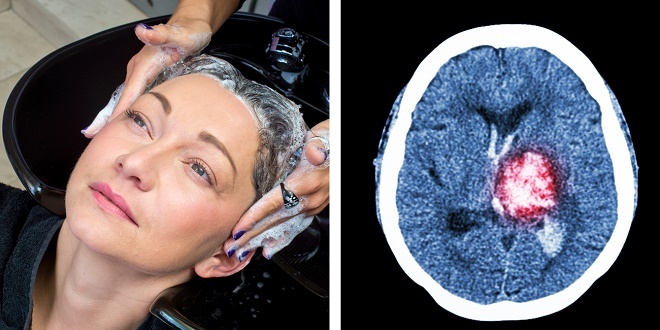 Apparently, this phenomenon is well-known to doctors and hair salon owners as well; it actually has been dubbed Beauty Parlor Stroke. It is critical that salons have chairs that recline into a position that allows your neck to rest comfortably in an appropriate lip on the sink. Without ample support that leaves your neck at a healthy angle, anyone can be at risk for what happened to Elizabeth. Listen to her story in the video below in which you will hear about her 8 month recovery, and her desire to warn others about this relatively unknown danger, so that this completely avoidable hazard, never has to cause damage to others. It should also be noted that adjustments should always be made for differences in height, that could also impact the angle of the neck.